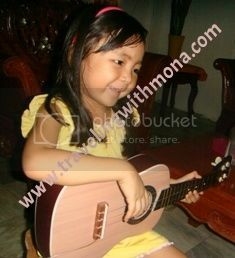 I was browsing my photo files and saw photos of my daughter with her first ever guitar. This was free from her organ. My daughter was 3 when I took this photo. Time flies because in few days she will celebrate her 6th birthday. I know daughter has passion for music because she loves singing and playing different instruments though many of them are just toys. I hope one day she would have the chance to play real instrument. I know she loves this thing so I hope in the near future she gets all the possibility to play all the instruments including the best pandeiro at guitar center. And if only i have lots of money I will give everything to continue her passion for music.